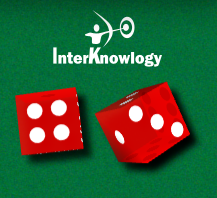 Disclaimer: InterKnowlogy is not in the business of writing gambling or casino games. This application was only written for research, with no intention of using it in a real gaming situation. Here at InterKnowlogy, we have a program called RECESS (Research and Experimental Coding to Enhance Software Skills) – where we get to spend Wednesday afternoons working on whatever we want, to further our skill set, maybe in a technology area we don’t touch on our everyday projects. 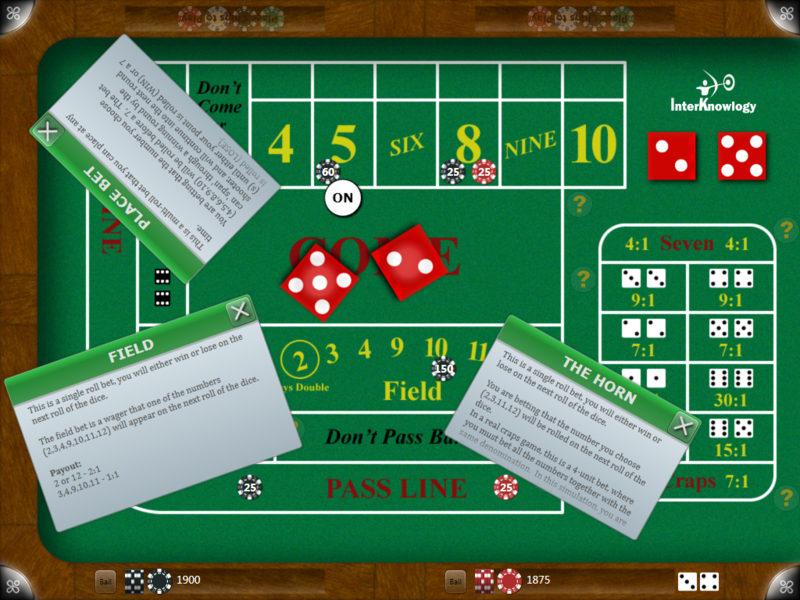 We’ve been writing apps for the Microsoft Surface table for a while, and I decided it would be cool to write a Craps game. One of the main ideas of the Surface table is to encourage multiple people to use an application simultaneously while sitting around the table. What better way to do that than to place bets, “roll” dice, and win “money”? Before we get too far, check out the video of the game in action. Now I’ll get into some of the cool design and implementation aspects of the application. Obviously, you need to place bets to play craps. 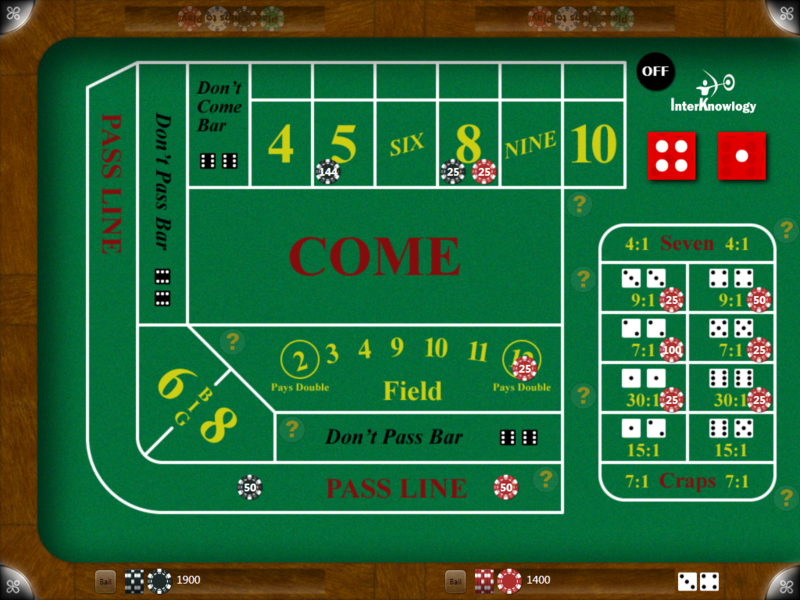 At a real craps table, you place bets with your chips on the table, so in Surface Craps you do the same. We use a stack of chips taped together just so they’re easier to hold, and we use “object tags” stuck onto the bottom of the stack to uniquely identify you as a player. The Surface has cameras inside the case that recognize the object tag patterns and wake us up in event handlers with information about the tag that was placed. When your chip stack touches the table in a “bettable area” the bet is recorded, and a visual indication of your bet is added to the table. 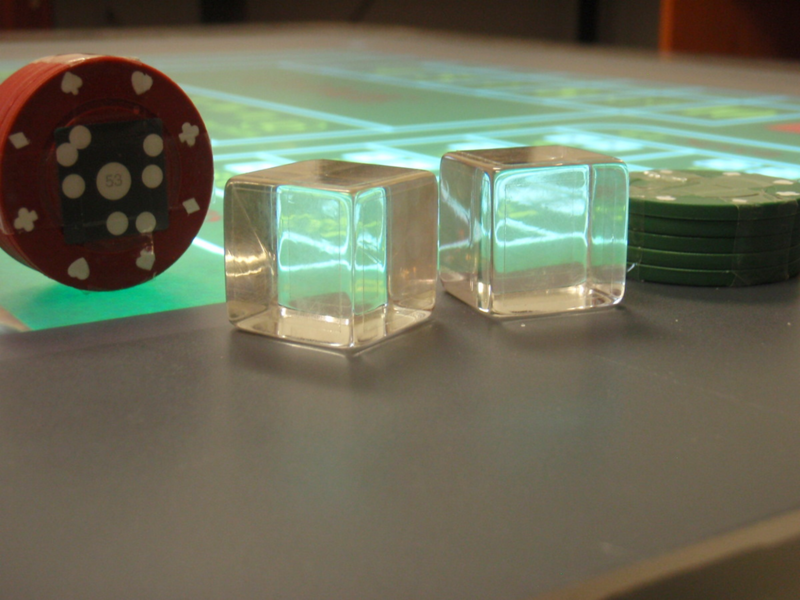 Up to 4 players can play at the same time, each having their unique stack of chips and placing bets on the table simultaneously. I came up with a UserControl that I call a BettableArea that allows me to know if a tag (stack of chips) is placed somewhere on the table that allows bets (as opposed to dead space around the table, etc). This control’s content is a Path that defines the actual region that’s bettable (to allow for funny shapes) and also has 4 properties that are filled with the location where the virtual chips should be placed for each player in that region. 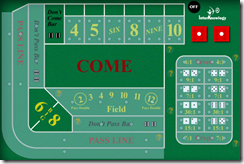 The screenshot below shows the BettableArea controls with their opacity turned up to show them at design time – notice the curved and angled paths used to follow the actual betting zones. 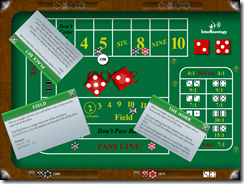 A quick aside: on a real craps table, the dealers will place the chips for a player at a spot on a bettable area that’s related to where they are standing around the table. 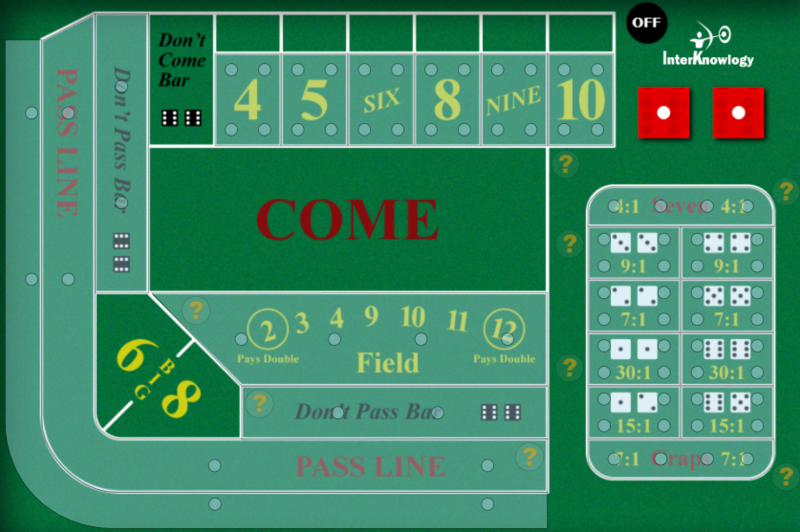 (if you’re at the right corner of the table, your bets will be at the right corner of the bettable area). 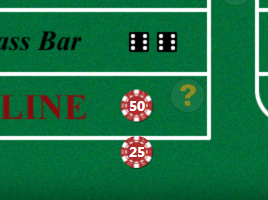 When a bet is placed on my Surface Craps table, the visual chips representing your bet show up at one of the 4 spots defined in the BettableArea control depending on which player you are. 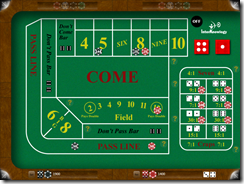 Many craps players know that the “Place Odds” bet behind the Pass Line is the best bet in all of Vegas. So, YES, Surface Craps does support placing odds behind the pass line bet, and even enforces the fact that you can’t do it until a point has been established! After you place your initial bet with your chips, we had to come up with an easy way to change the amount you’re betting. I came up with something I call the “Ratchet” gesture. You place your chips back down on the table over the existing virtual chips and I show a couple arrows on each side with the bet amount. While holding the chips down, you turn them left or right (say as if you’re unscrewing a bolt). 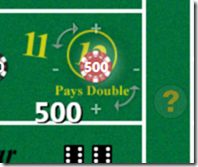 As you turn, the bet amount is adjusted up or down depending on the direction of the turn. 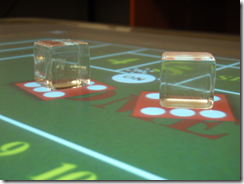 I also used this application as a way to learn WPF 3D. Cubes are about the easiest object to make since they’re square, and thus only require 2 triangles on each face. They material is semi-translucent to be able to see through the dice faces to the back of the opposing face. 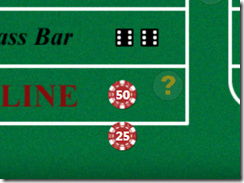 I use WPF animations to rotate the dice along 2 of the 3 axis when the user flicks the dice to “roll them”. The dice spin at a rate consistent with the force of the flick detected by the Surface cameras. I came up with a pretty straight forward architecture to allow me to process bets and payouts after each role. There is a BetLogicBase abstract class from which I derive a specific bet logic class for each type of bet (pass line, field, hardway, etc). They all implement the virtual ProcessRollResult( ) method, applying their specific logic for that type of bet, and determine what they should do with the bet they’re attached to: payout (win), remove chips (lose), or nothing. This design makes it super easy to generically process the bets after each roll. I just loop through all the BettableAreas and call ProcessRollResult( ) on any bets in that area. Instead of On-line help, I came up with “On-Table Help”. If you’re wondering how the hell to play c raps, or can’t remember what the rules are for a particular bet, you just touch the faint question mark button next to that area, and up pops a ScatterViewItem with the information you’re looking for. Among other things, it tells whether it’s a single roll bet, or multi-roll, and what the payout table is. Finally and definitely one of the coolest features of the game are the acrylic dice. 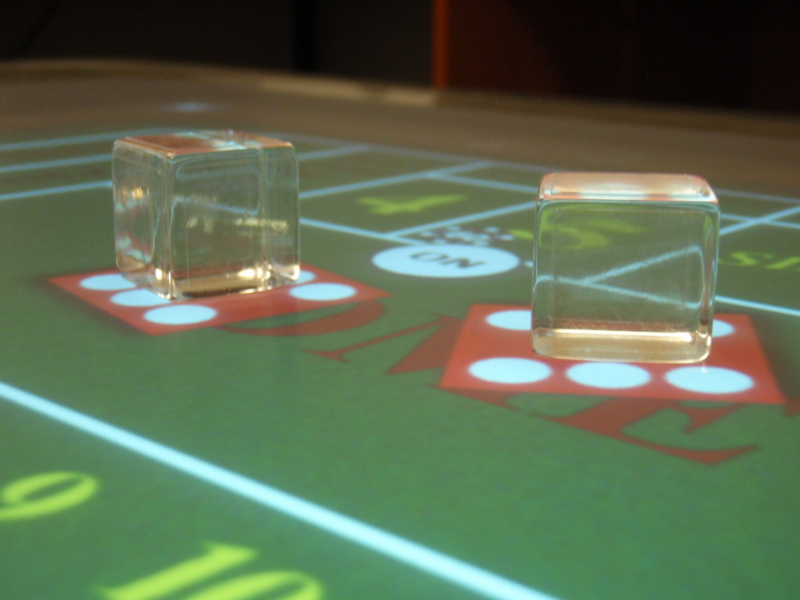 We only just got these dice in the last month, so until then you only play Surface Craps by flicking the virtual dice on the table. We got these dice that are transparent, and have nearly transparent byte tags on them. My understanding is that the IR sensitivity of the dots in the stickers on the dice is set so that the Surface cameras will recognize them. VERY COOL! So I recently went about implementing the ability to roll those physical dice on the table, and have it recognize which face they land on. I show a visual of the correct face of the dice under each physical die, and process results just as if the user had flicked the virtual dice. Whew – long winded I know, but I’m super stoked on how this game came out. Take a look at the video if you haven’t already, and let me know what you think. Any ideas for other options or functionality in the game? Thanks to Kevin Kennedy for the graphic design of the UI – he’s one of the InterKnowlogy graphic design studs. Another thanks to Joe Seymour who helped me with the betting/payout engine. After publishing the last version with property filter support, I continue to get suggestions from people using the tool for other properties and groups that should be included. This is obviously begging for the data to be based on configuration, so I dove in and made it so. It’s not as straight forward as a simple app.config setting, since the code that displays the property grid and needs to know about those property filter groups is running within the process space of the EXE that you’re snooping. So you still edit the config file that’s in the directory where have snoop.exe installed, but at runtime, the config is read “remotely” from the snooped EXE. The comma-separated values in the PropertyNames attribute are split and used as case-insensitive substring searches. I just finished a WPF project where we used Visual Studio 2010, and it required lots of WPF canvas layout. Normally I would fire up Expression Blend to lay things out exactly where I want them, and be done. Unfortunately, Blend 3 does not (yet) like VS 2010 project files. So this made for a very tedious couple months of run-time adjustments of elements. I would run the app, and use Snoop to adjust Canvas.Left/Top, Margin, Width/Height, etc, each time, typing in a new value, seeing the changes in the app. UGH. So that was the motivation for this new feature. Now when you select a property in the property grid, for fields that support discrete changes to their values, you will see an additional copy of the current value in the right edge of the current value column. The great thing about this copy of the property’s value is that you can mouse wheel over them to CHANGE THE PROPERTY VALUE! For the “multi-part” data types (Thickness and Brush), you can change individual parts of the property by mouse-wheeling over just that part. So this ends up giving me a run-time design experience where I can quickly tweak layout and style without a bunch of text typing / editing. The binaries – one folder for 32-bit and one for 64-bit. The source code for the solution. Give it a try! Hope you like it. The popular Snoop tool from Peter Blois has been out for a long time, and I use it almost every day in my WPF development. However, there has always been something missing: a native 64-bit version. My coworker Joe and I finally decided that it was worth looking into building one. There were a few tweaks to the code itself to compile in 64-bit, and then some project build directory settings changes … but for the most part, it was pretty straight forward to make. So with permission from Peter Blois, I have created and posted a true 64-bit version of Snoop. Mind you, this is version 1 of Snoop – haven’t yet tried to tackle version 2. 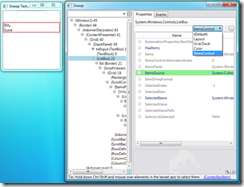 I tend to use v1 in my everyday WPF dev – not having property editing in v2 is a showstopper for me. Snoop works its magic by injecting a DLL into the process space of the app you are snooping. The problem with snooping a 64-bit app with the original snoop is that the injector DLL was always 32-bit, and when Snoop tries to load a 32-bit DLL into the 64-bit target application, you get the invalid image exception. While I was in there building Snoop, I decided to throw in a couple other tidbits – either changes to small things that have always bugged me, or small features that I wish the original had. “ShowAllProperites” ToggleButton is off by default. I find that more times than not, the properties I want to look at are in the “defaults” set, so this keeps the properties list much shorter. Use a 2nd monitor if present. My everyday use of Snoop is that I choose the app to snoop, the SnoopUI comes up and I move it over to my 2nd monitor. I added some code to do this automatically if there’s a 2nd monitor present. Scroll to Selection – when you snoop on an element in your app with CTRL+SHIFT pressed and the element is found in the tree, the selected item is automatically scrolled into view. Custom property filter ComboBox. In addition to filtering the properties list by text, there is now a ComboBox next it that allows to filter the properties by functionality. For example, if you choose “Layout”, you see only properties like Width, Height, Margin, etc. that have to do with layout. Choose ItemsControl for things like ItemsSource, SelectedItem, etc. 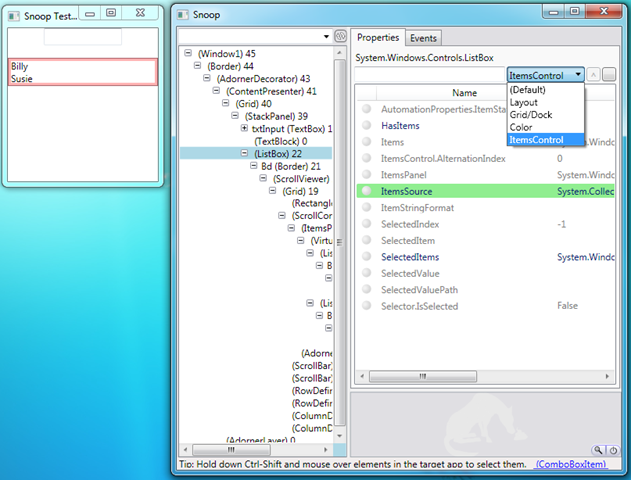 This screenshot shows snooping on a ListBox with the custom property filter set to ItemsControl to quickly see everything related to ItemsControls and Selectors. Indexer delve. This is the small TextBox to the right of the Custom Property ComboBox. If the current property type (that you’ve delved into) is an ICollection, you can type an index value in the TextBox and delve into that item in the collection. The indexer delve plays along with all the other delves, so you can pop context to get back to where you came from. Here is the properties window after delving into a collection data type (ListBox.ItemsSource which is ObservableCollection<Person> in this case). After entering a “1” in the Indexer Delve field (updates on text change), you see the Person object at index 1 in the above list. There you have it. I hope these enhancements, along with a native 64-bit version are helpful in your WPF development! Here is the zip with both 32-bit and 64-bit folders. And since the original source was posted, here is the source code for this updated version.